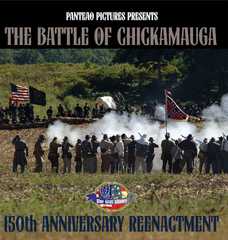 The Battle of Chickamauga 150th Anniversary Reenactment was held in Chickamauga, Georgia at Mountain Cove Farms on September 19-22, 2013. It was hosted by the Blue Gray Alliance with the support of Walker County, GA, the GA Department of Natural Resources, and GA State Senator Jeff Mullis. This 90 minute video documents the event, from the sutler and civilian camps, interviews with event attendees, and the battles that were held on each day. It also contains a slide show of over 150 still images taken throughout the event. 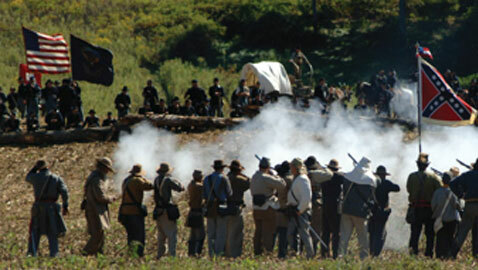 Over 4,000 reenactors and historians went to Mountain Cove Farms to depict one of the Civil War’s bloodiest battles. Panteao Pictures was also there to document the event and film footage for the upcoming motion picture, Alexander’s Bridge. The video is available online streaming for Panteao subscribers and pre-orders are being taken on the Panteao website. Participants of the event can get a copy of the DVD for free. Simply email your name, address, and reenactment unit you are a member of to info@panteaoproductions.com. Panteao Productions is a video production company that produces instructional videos from the top firearms instructors in the world. For more information about Panteao, visit www.panteaoproductions.com. Previous articleCan Cowboy Action Shooting Pay Real Dividends In The Real World?